Some entries in this blog are longer than others, not because the products are necessarily better or more interesting, but because I know more about them, either through the creative process or through having run them. Bone Hoard of the Dancing Horror, published by Purple Duck Games, is the first adventure that I wrote for the Dungeon Crawl Classics role-playing game. I have one or more items in every issue of Dragon Roots Magazine, including adventures written for 3rd Edition Dungeons & Dragons, so Bone Hoard is not my first published rpg work. It is my first foray into DCC, though – published or not – and as such it holds a special place in my heart. The genesis of Bone Hoard was as follows: Mark Gedak, owner of Purple Duck Games, had some maps created by Kristian Richards. He asked on the Goodman Games forums if anyone was willing to try filling them in with DCC content, so as to create a Purple Duck DCC product line. I jumped at the chance, and received the Bone Hoard map to work with. As would later occur with Stars in the Darkness, I was immediately struck with the way Kristian Richards “filled” the bottom of the chasms on the map. That wasn’t just darkness, so what was it? Thus, the nacreous fluid was born. Now I just had to decide what it did. Decades of playing Dungeons & Dragons had created an expectation that monsters simply tried to kill you. Sure, they may do it in different ways, but mostly they just go after hit points. The result is that, barring level drain, there is little of the frission of horror that real monsters would create. But what if the monster didn’t want to kill you? What could it do that would be far worse? Everything in the adventure arose from that simple question. Well, that and the advice about monster death throes…and making monsters unique….and unique magic items. The monster critical hit charts in DCC are also amazingly liberating, in terms of what monsters should be “allowed” to do. I have run this adventure several times now. I have run it publicly and privately. I have had players who feared it enough to freak out when they entered a certain portion of Jon Marr’s A Gathering of the Marked, because they thought that they had entered the Bone Hoard. And I have watched a critical spell check result on flaming hands take out the hoardling before it had a chance to harm even a single PC. Years later, and many more DCC adventures under my belt, Bone Hoard of the Dancing Horror still holds a soft spot in my heart. 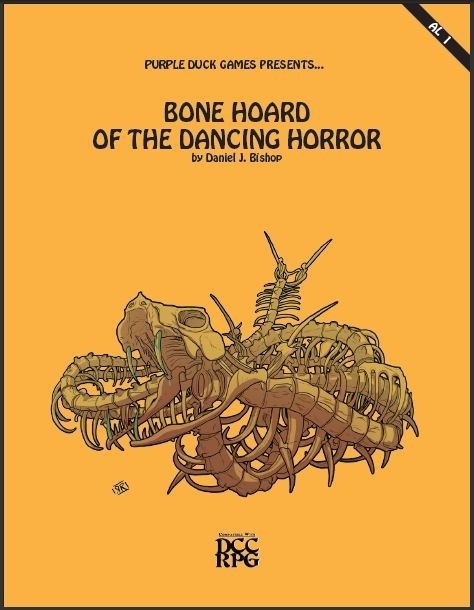 Bone Hoard of the Dancing Horror can now be purchased in print!